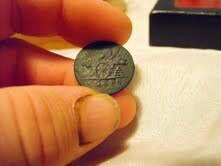 My fellow club member and customer Tom Colvin made the find of a lifetime recently with his XP Deus. Hunting in Basic 2 Tom says he got a very strong signal, even with his 11 inch coil a foot off the ground, toggled over to Gold Field to check the reading and then began to dig. About a foot and a half down he uncovered an unusually heavy iron looking thing and thinking it was just junk iron of some sort, chucked it against a tree and forgot about it. Two weeks later after some heavy rains, he noticed the dirt had washed away and it wasn’t rusty like other iron junk. The exposed fusion crust with small areas of rust, black spots and a stony appearance alerted Tom to the possibility it was meteorite. 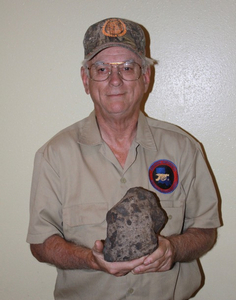 So, Tom got in touch with an expert on meteorites who instantly identified it as a 16 pound Chondrite meteorite! 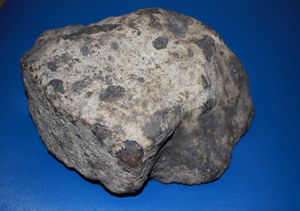 It is composed of iron, nickel and stone and is incredibly dense. 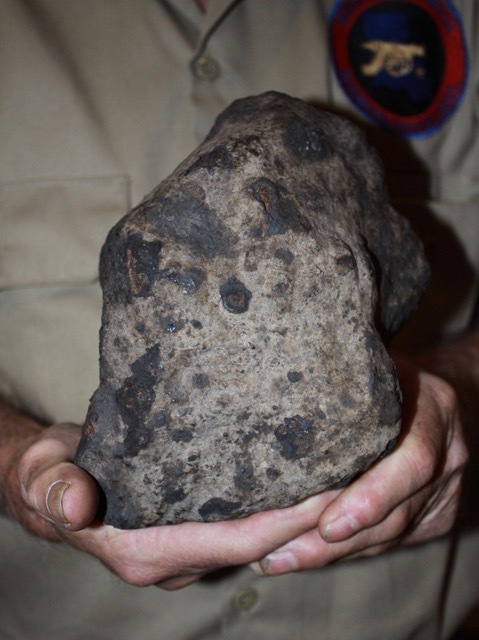 Folks search for these all the time since gram for gram meteorites can be worth more than gold but rarely does anyone find a 16 pound one! 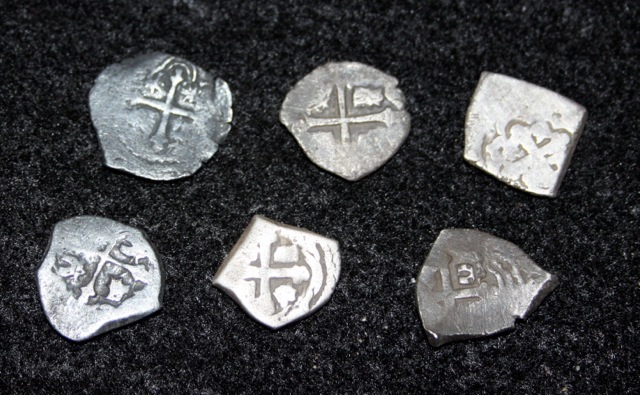 Chalk up another great find for the XP Deus and congratulations to Tom! 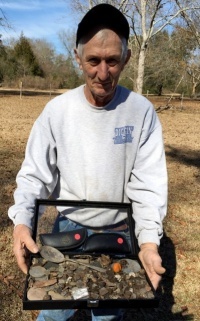 "Terry Smith of Longview, Texas shows off finds he made at a competition hunt recently. Terry attended the Deus Bootcamp in Gulfport and says the Deus is the finest detector he has ever used and his finds certainly seem to bear that out!" 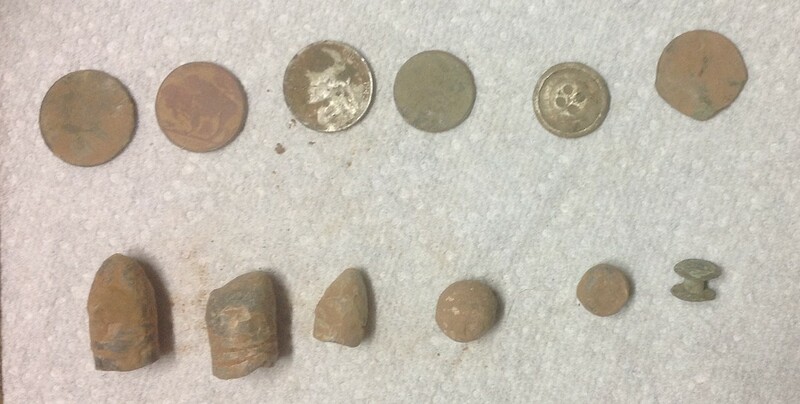 I just got back from a two day trip to Nebraska and eastern Colorado. 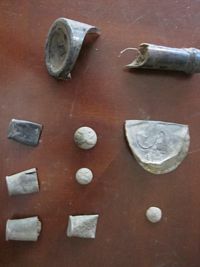 Here are some relics I found using the XP Deus in Relic Mode. 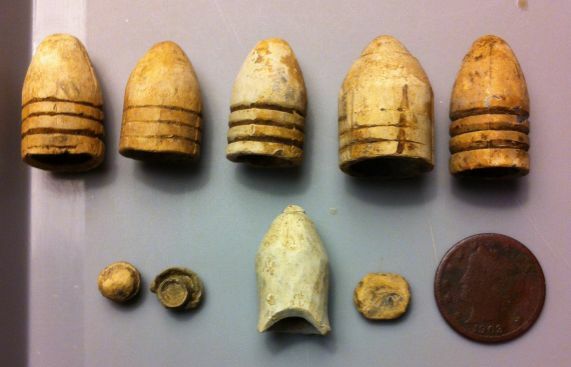 The unfired bullets came from a supposed military campsite from 1876. 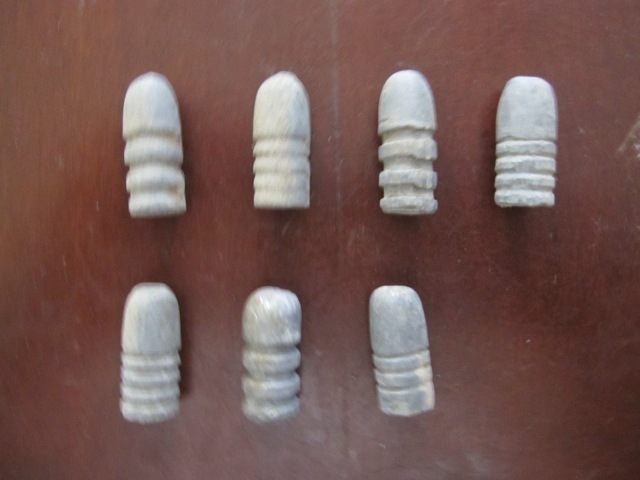 I have no idea why so many bullets were removed, unfired, from the 1873 Springfield. 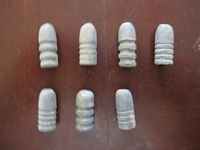 Found no casings, so wonder if perhaps Indian scouts removed the bullets so they could have the copper cartridge for decorative purposes. That’s my best guess. 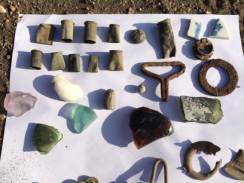 The other pictures are of artifacts found at the campsite from my last set of pictures. 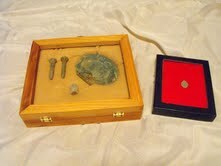 Two more military buttons, but the best item, I think, was the US buckle. It was bent in half. 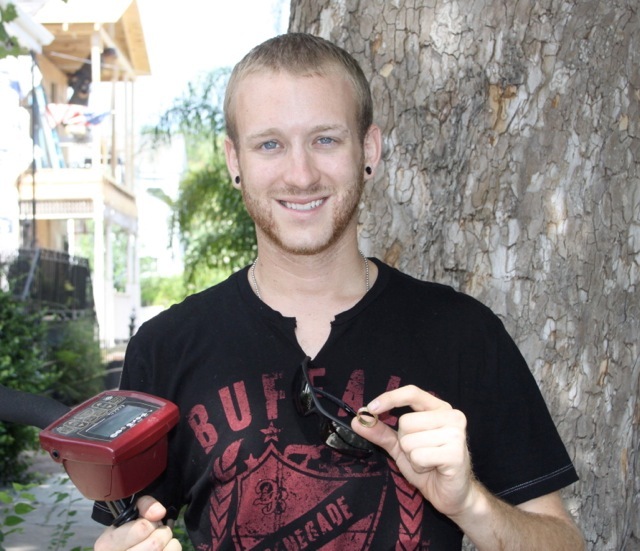 I took the picture showing that and then straightened it out for the other picture. 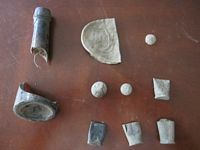 The large items were twin “tins” for storing ammunition for the Civil War Springfield, muzzle loading paper cartridge. 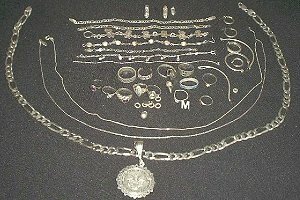 I have a modern picture showing how they would have looked before lost. I did not get a sound for other items in the ground more than a foot deep, but suspect that perhaps I missed finding the brass US buckle shown in the picture, as well as the buckles that accommodated the ammunition leather ammunition box. 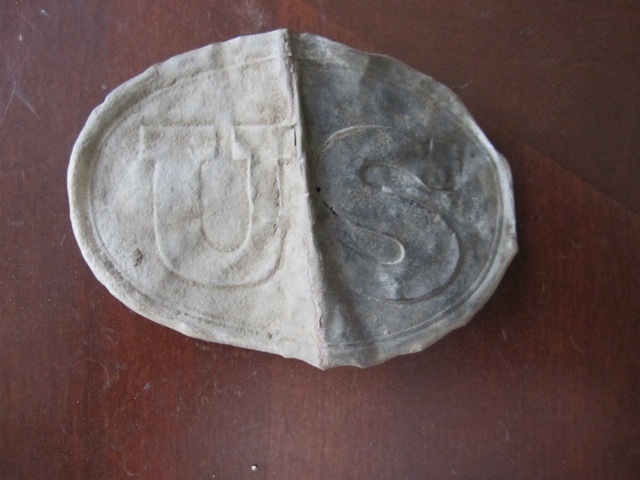 I also found another tin several yards from the other two. This, however, verifies the camp as a likely 1865 infantry camp to protect freighters while crossing the Platte. 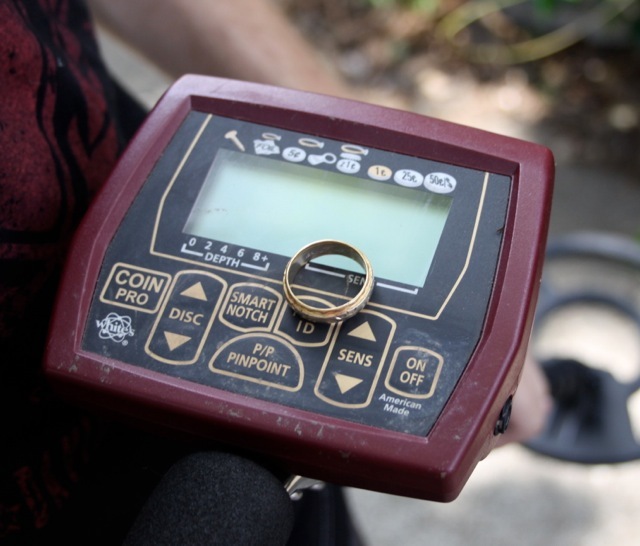 We purchased out new Deus detectors while attending the Texas Association of Metal Detecting Clubs annual convention, which was held this year in Sweetwater, Texas. 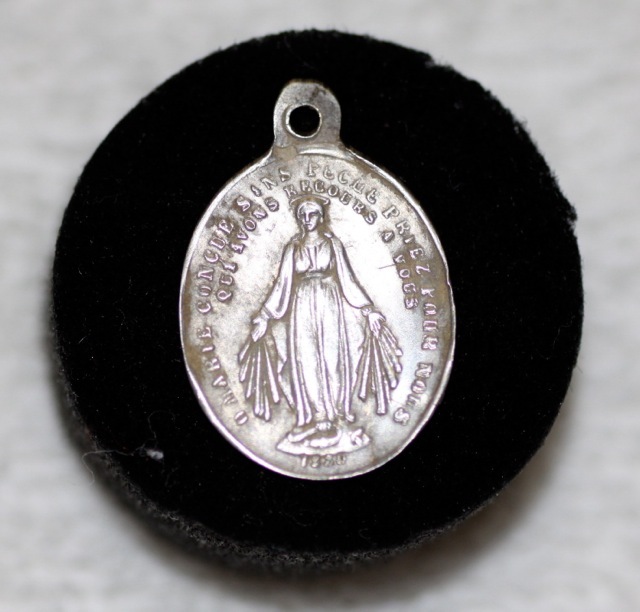 Upon return to Colorado, at our fist chance to use the new Deus, we went to a location in northeastern Colorado, along the South Platte River, which as in the 1860s the main road to haul freight into Denver and the Rocky mountains. At one of the known crossings, not far from Julesburg, where there was much action in 1865 and through 1868 with mostly Cheyenne warriors, contesting the advancement of white civilization into their prime buffalo hunting grounds. Once we got on the north side of the river we sited an area that was flat and could have easily overseen the wagons crossing the trail. 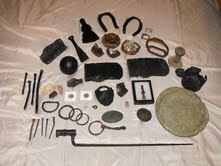 Bingo, in about 4-5 hours of searching we found the items shown in the photographs. All of the relics date from the 1860’s. 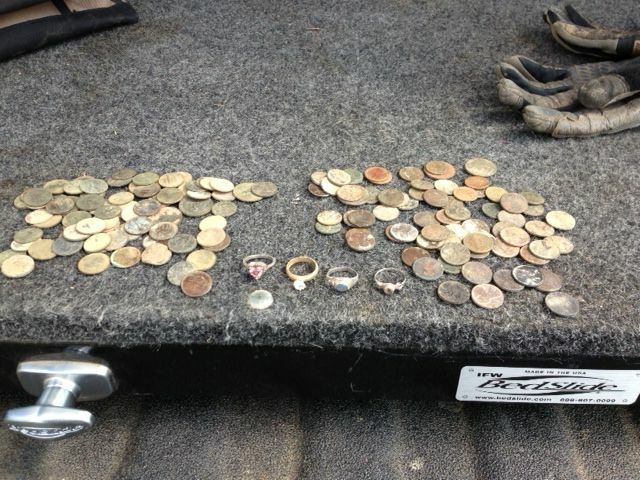 Customer Casey Nunez's huge pile of finds after using the Coinmaster Pro for only one month! Way to go Casey. Deus Prevails at well hunted park. 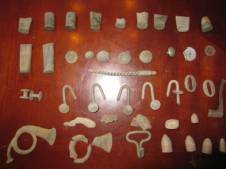 Hunted a lakeside park that we have hammered with several detectors the last few years. Candra said the Deus is awesome. 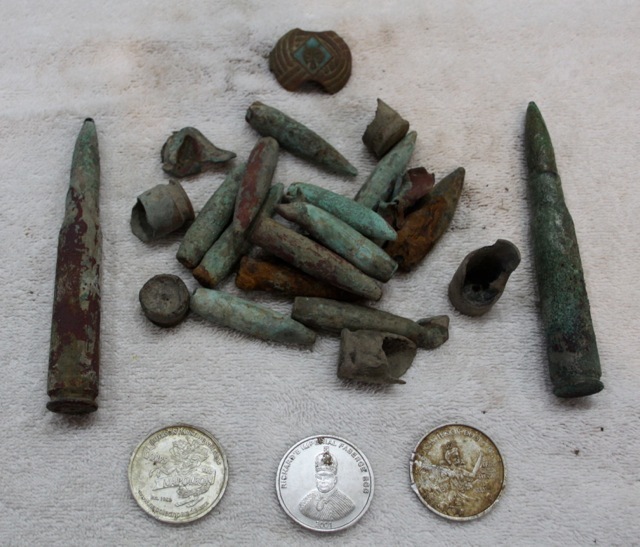 So I went to a battlefield (on private property with owner's permission of course) and found one modern .22 and one small caliber fired round ball, one tiny flatened ball (game piece?) 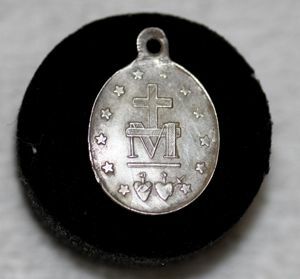 and a surprise or two. 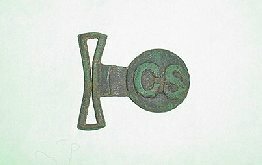 One minnie had been made into a pencil, complete with halfmoon base cut for tip of index finger, and a worn 1903 V nickel (confederate, obviously). All small ones were found within 3 inches and all minnies at 6 to 8 inches. They are where they are found! 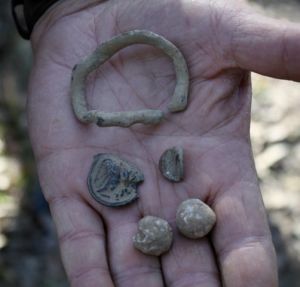 I found a very nice horse shoe (looked handmade) with practically no rust, except for the remnants of nails still in it at 15", but it must have fallen out of my pouch before I left the woods. 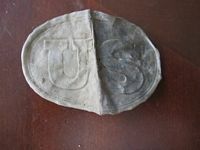 I also found a peanut butter aluminum wrapper at 25". Discrimination works great for nails and smaller objects. Cannon balls, horseshoes and all aluminum will all give good signals at any depth, as will larger nails and shell frags. My testing isn't complete, and I don't know where to test in northern VA for DIV, however. The machine is far from complicated like a DFX, for example. But it has to ground balance to perfection and then be run in "auto" for best results for a novice Blisstoolist. 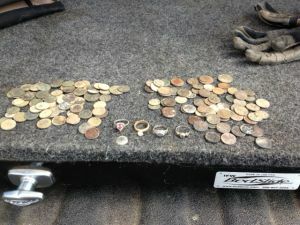 I consider this a great result for a first-time out in a thoroughly hunted area which I only hunted about 7 hours, with lots of movement time. In good ground (low mineralization). 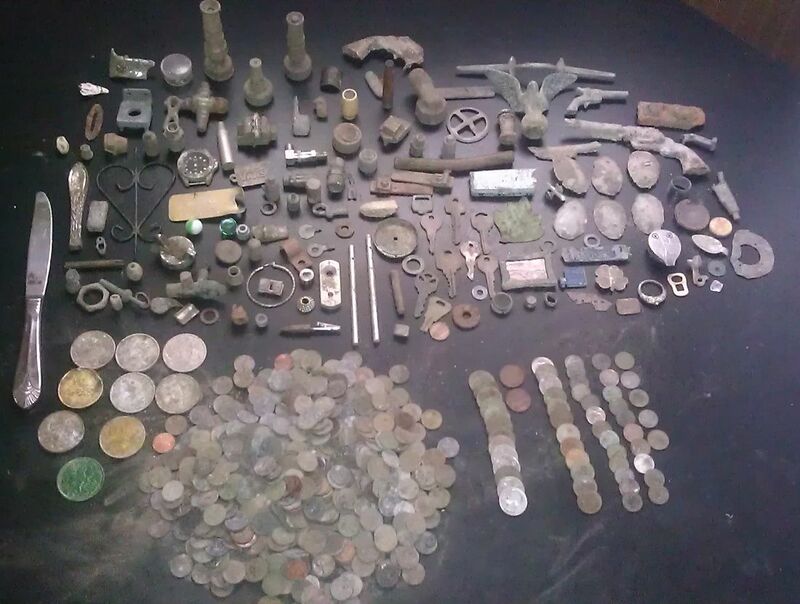 It is absolutely a Very deep detector with good relic-hunting discrimination in good soil; I'll report back after DIV as to highly conductive soil (according to the factory expert at minelab-not highly mineralized). Blisstool sniffs out a Pelican button at a hard hit site along with a flower button, buckle and two musket balls. 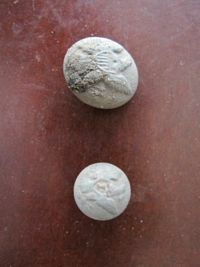 The musket balls were 10 to 11 inches deep while the Pelican button was fairly shallow only about 6 inches. 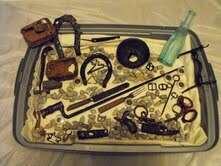 The horse tack buckle was about a foot deep. Customer Jim B. made these remarkable finds in Mexico with his new Deus and couldn't be happier. 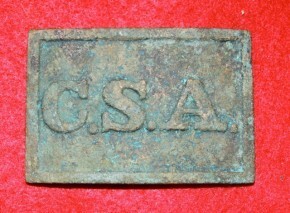 Here is a remarkable Atlanta Style C.S.A. 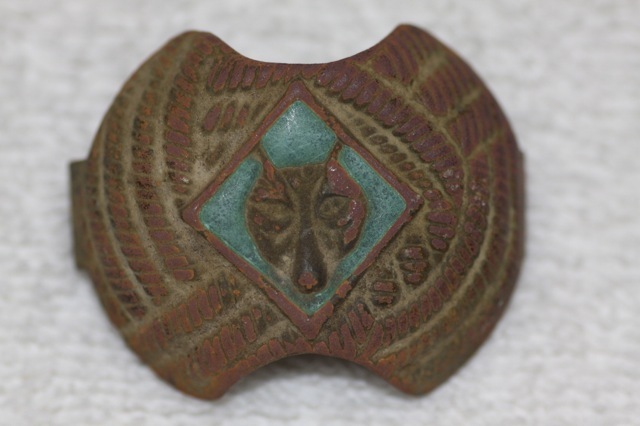 plate dug by customer Jeff H. using a pre-owned Shadow X-3 equipped with a 7 inch coil he purchased from us. The Shadow X-3 with the 7 inch coil can do some real serious hunting in the relic fields! All of these fine Civil War relics were dug by Jeff Harrison over the past couple of months using a pre-owned Shadow X-3 he purchased from us. The Troy Custom Detector Shadow X-3 and the X-5 continue to be deep seeking, very sensitive detectors that really deliver in the relic field. 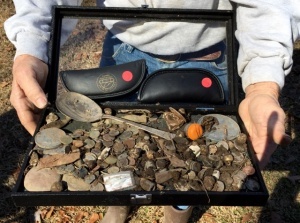 Here are the first finds hunting with the Blisstool in a plowed field. Hunted in auto ground balance with detector set at 5. This is a deep machine! 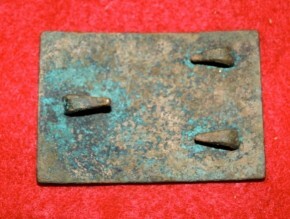 The smallest brass hit around 7-8 inches hard. 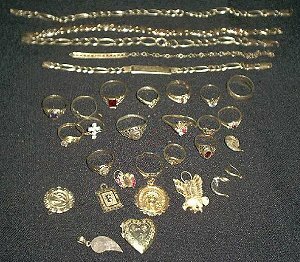 Usually where the bigger stuff starts to die out with most detectors. 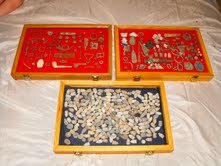 The flat button on the far left was over a foot as were the Minnie's ....a nice plus was the silver war nickel. Was surprised at the lack of falsing of the machine in auto. 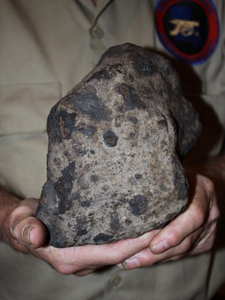 The area had very low mineralization. 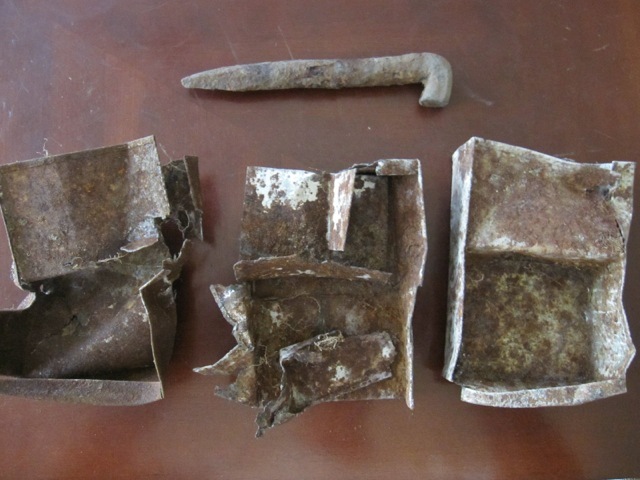 I did dig some iron, but 95 % of that was by choice due to the age of the site bringing up some colonial or Civil War era iron tools. It was rather easy to differentiate from a good target to iron. 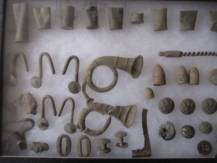 It sounds off on lead and brass and does not leave much doubt on whether to dig or not. One of the Minnie's sounded 3 inches deep.. kept digging and at about 9 inches kept getting louder..thought I had large brass or plate, at about 14-16 inches finally got the booger out..it was in the hard pack below plow line with no white patina...obviously had not seen the light of day since it was dropped. All in all a good start for a couple of hours in an area that has been hit hard, but not with this machine!!
" Jeff H. of Franklinton, La. 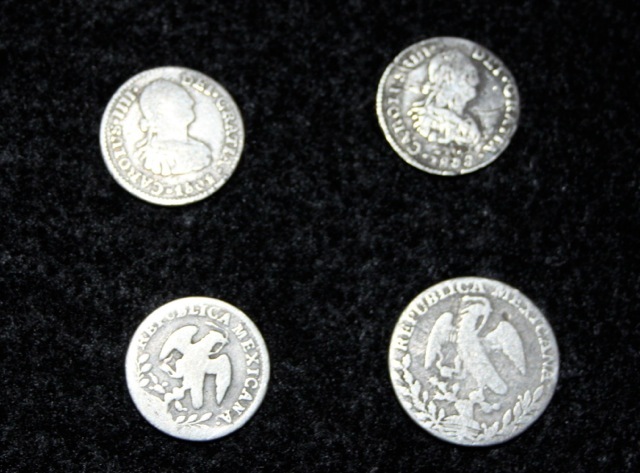 has set a new "coins per month" personal record since buying his new Coinmaster Pro. 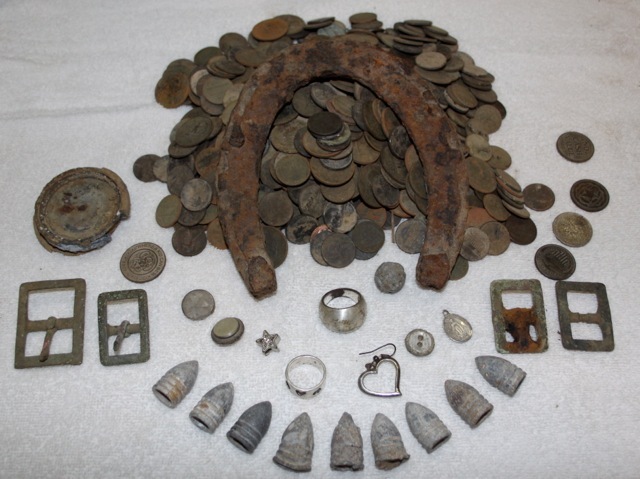 That's 620 coins under that lucky horseshoe. Jeff also found a nice group of Civil War relics, .50 caliber rounds from the Hammond Bombing Range, a super Boy Scout slide and a nice silver religious medal. According to Jeff, " You can't beat the price on a Coinmaster Pro and you can't beat how it works. It's awesome! " 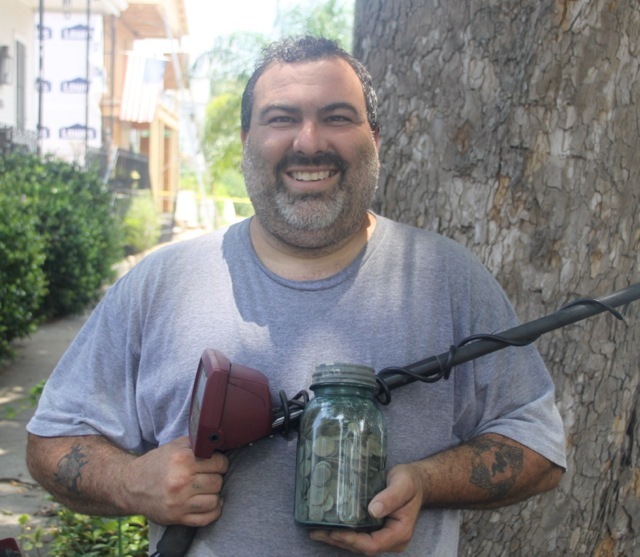 Congratulations to new White's Coinmaster Pro owner Donnie M. of Metairie, La. On his first outing with the Coinmaster Pro he dug a magnificent 33 gram, 18 K gold wedding band! 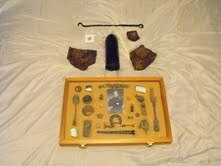 Since then he has put together a very respectable collection of artifacts to go with it and he has only been hunting two weeks!! 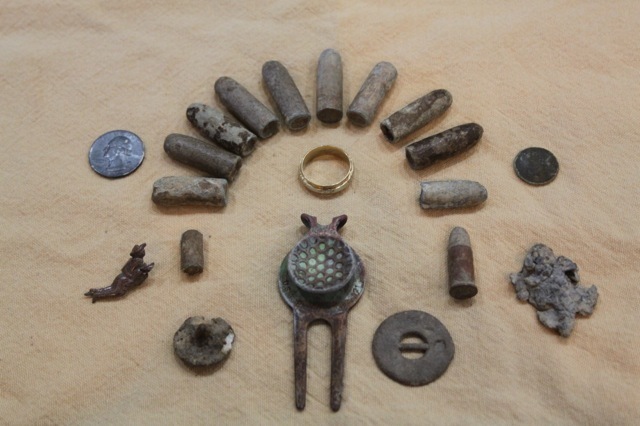 Among his finds with the Coinmaster Pro, a nice silver Washington quarter, 10 .50/70 caliber bullets, a .38 caliber bullet, a wheatie from the 1940's, a lead hem weight, and a golf divot. Way to go Donnie! Customer John Cooper bought his X-3 about a year ago and has had a remarkable year on the playgrounds in Texas. 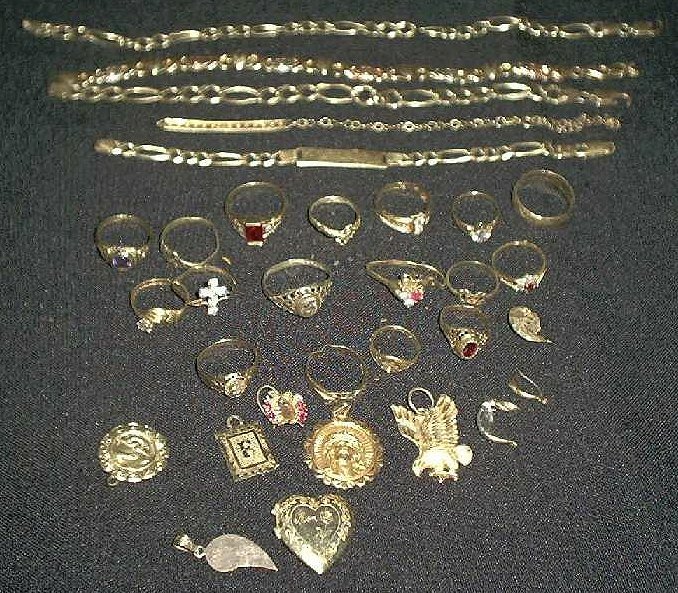 All of the gold and silver jewelry in these pictures, with the exception of the small gold Ruby ring towards the front of the gold finds, was found by John using the X-3 and the stock 7 inch coil. 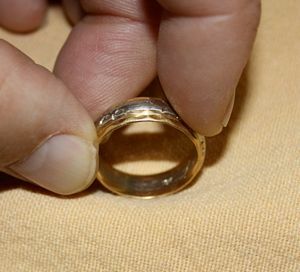 Beach hunters have nothing on John and his X-3, that's more quality jewelry than many beach hunters find in a year! 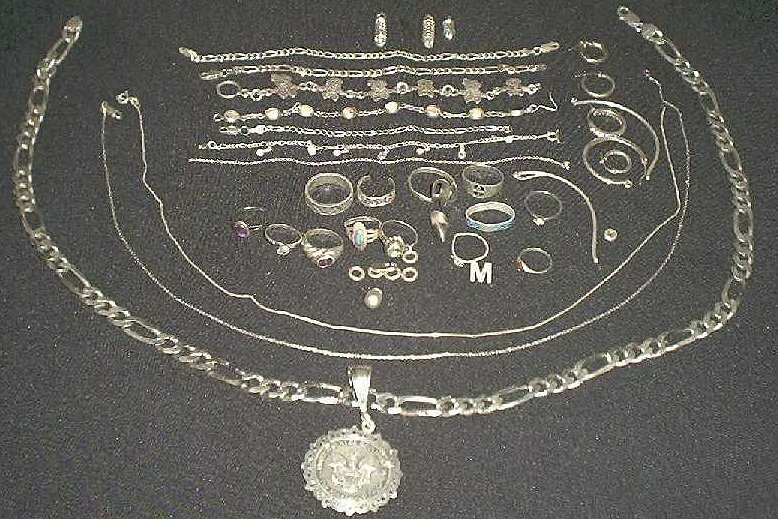 By the way, that heavy silver chain is almost 18 inches long! Congratulations, John...and keep it up. Darrell Domm is a longtime relic hunter who switched to an X-5 about a year and a half ago and has been hitting home runs ever since. 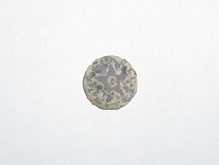 One of his first homers was the very nice and fairly scarce early American Naval button found during a club hunt at a local plantation. Darrell was using the 7 inch coil in Fixed G/B when he nailed it. 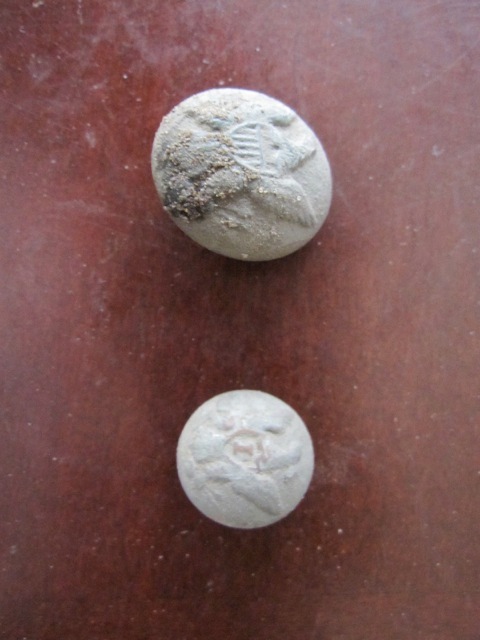 The second button is a very desirable Mississippi Cavalry button found at a site that has been hammered for years. 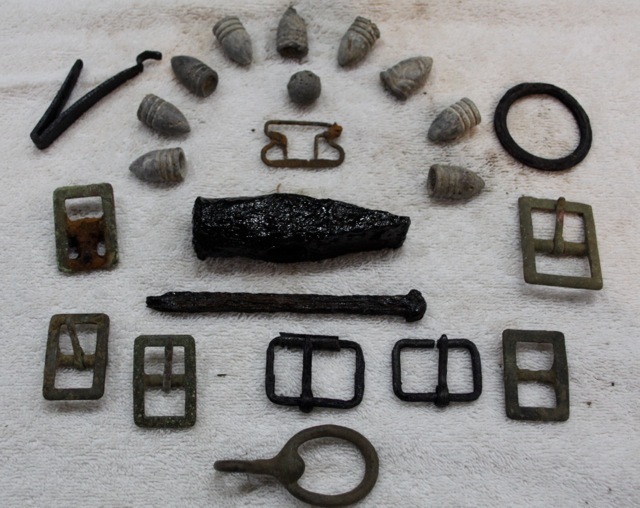 Darrell got into an area right behind some loggers who had bulldozed some old rifle pits and turned up this beauty and a bunch of minies to boot. 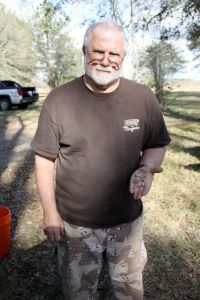 Next, he won the World Series, in my opinion, when he dug this absolutely beautiful CS tongue at a site that has been hunted hard for more than 30 years by hundreds of relic hunters. 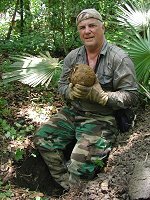 It was near the root of an old tree and Darrell heard it ring out loud and clear about a foot down with the 9 inch coil. Just goes to show that the X-5 is giving new life to old sites with its remarkable depth and sensitivity. 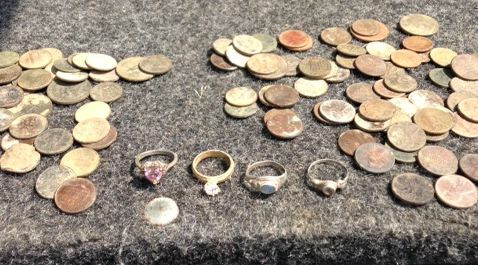 Congratulations to Darrell Domm,a fine relic hunter, for some fantastic finds.